You have been called to walk a Camino pilgrimage or Via Francigena to Rome, but you haven't got 5 or 6 weeks vacation, don't want to stay in crowded dormitories or walk alone. amaWalkers - run by experienced Camino pilgrims - offers 16 -day pilgrimages that fall somewhere between solo pilgrims sleeping in dormitories and the more upmarket luxury Camino Guided tours. Ours are no-frills accompanied pilgrimage walks (not tours on the Camino) meaning that you can walk your Camino your way, staying in in private en-suite rooms in carefully chosen pensions, hotels, casa rurals, and apartments, (recently described as 'too opulent' for mere Camino pilgrims!) and have the option of sending your pack ahead. All arrangements are taken care of by your experienced Group Leader (not a Tour Guide) while all you have to do is walk the Camino as a pilgrim, meeting up with fellow group members in the evening if you want to. We take groups of friends, religious groups, clubs, and those who want to walk with like-minded people. If this is the kind of pilgrimage you would like to do please send us an email or contact form. ​ We’ll be happy to share our love of the Camino and Via Francigena with you! If you would prefer a more up-market Camino Tour we can make recommendations. ​ Syl, Jenny and the gang. Walk the first long-distance pilgrimage trail in South Africa which has been established in the beautiful southern regions of KwaZulu Natal, between the Southern Drakensberg, the Midlands Mist Belt and the Eastern Cape. Strung out across the hills and valleys between the Drakensberg and the sea, like knots on a string of Rosary beads, are twenty-two historic Trappist missions. Established over a century ago by extraordinary Trappist monks, led by Abbot Francis Pfanner, the Mission churches are hidden treasures that we want to share with the world. We walk to 8 of the Missions after visiting the mother at Mariannhill. When is the best time to walk - ​Spring or Fall? ​It is harvest time in the fall and starting end of August and September there are many harvest fiestas with an abundance of fruit, wines, breads and other produce. IMPORTANT - enjoying your walk on the Camino will depend on whether or not you are walking fit. Poor □ Can’t hike 20 km (12.4 miles) day after day or do hills. Roncesvalles where we'll have an opportunity to take part in a thousand year old pilgrim blessing in the Abbey of Roncesvalles. 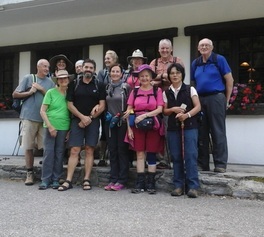 If you feel daunted by the thought of crossing the Pyrenees, you have the option of joining the group at Roncesvalles and starting your walk from there. The choice is yours. After visiting Burgos and Léon we will hike to the highest point of the Camino in the spectacular Irago Mountains and leave a pebble at the foot of the Iron Cross – the enigmatic Cruz de Ferro. Our walk in Galicia will take us through eucalyptus forests, small farms with dry stone walls and dozens of charming villages and hamlets. Walking the last 100km from Sarria will qualify you for the coveted ‘Compostela’ – a certificate in Latin confirming that you have walked the Camino to Santiago de Compostela. You can have an optional extra night in Santiago so that you can visit Finisterre - The End of the World - a fitting end of your wonderful Camino experience. Click on 'MORE' above for information on costs, FAQ, accommodation, what's included, training etc., or click on the links in the red banner above. PLEASE read all the pages on this website, including the Booking Conditions below, so that you have all the information about the walk, how to train, costs etc. NB: amaWalkers Camino (Pty) Ltd is not a travel agent. We do not make flight or transport reservations. We don't offer self-guided tours. We only make accommodation bookings for our accompanied groups. Start at the pilgrimage town of Lourdes where you can visit the grotto of Our Lady and take part in a candlelight procession at night. 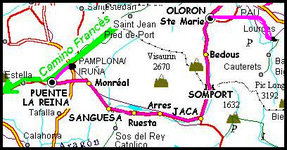 We walk west for 3 days to Oloron Saint Marie and then south for 3 days to the 1600m (5200ft) Somport Pass into Spain. This is a more rugged and remote walk than the Camino Frances with fewer coffee stops and other pilgrims. Aragon has an ancient landscape with castles and historical monuments dotted along the 170km route, much of it on a Roman Road. We end our walk in Puente la Reina where we meet up with pilgrims coming from St Jean Pied de Port. ​Our walks are designed for small groups - a minimum of 8 and a maximum of 12 – perfect for singles and those who do not want to walk alone. Ours are not big bucks, luxury, guided tours with air-conditioned back-up bus, 5-star hotels, pre-paid gourmet meals and guided visits to museums or art galleries. We stay in private rooms in small hotels, pensions and rural houses especially chosen by amaWalkers. Our experienced Camino pilgrim Group Leaders will share their love, passion and knowledge of the Camino with you, leaving enough space for you to discover some of the magic of the pilgrimage for yourself. Their goal is for you to have the most wonderful Camino experience possible. None of the walks require technical hiking (no ropes, poles, scrambling or climbing) but the terrain is varied - from asphalt to dirt, rocky, shale, grassy paths and a few roller coaster trails up and down hills. If your level of fitness is 'Poor' or 'Average' you will need to do some training so that you can hike 20+ km [12.5 miles] every day. LUGGAGE TRANSFERS are optional. Bags are transported from hotel lobby to hotel lobby, mainly by retired people, many of them women. Some historic buildings do not have elevators so the 15kg (33 lb) limit per bag is important for both you and the people who transfer your bag each day. If you have more than 15 kg (33 lbs) extra luggage you will need to transfer more than one bag or send some stuff to Santiago for collection there. ​From the walled town of Lucca in Tuscany, to the lake district of Lazio and to Rome, we will follow in the footsteps of millions of pilgrims who trekked to Rome and the Vatican. We will stay in a variety of accommodations from small hotels, monasteries and religious houses. A huge "Thank you" to you for all that you do to make these trips so seamless and well-organized. After we saw the standard of the accommodation in Spain (much nicer than was expected!) we realized that your profit margin from doing this has to be quite small, so thank you for doing this as a mission and a passion to support the Camino. I think you really have succeeded in what you set out to do- to create a way for folks to experience the Camino without having to deal with logistics, and with the support and encouragement of like-minded group members and our stellar group leaders. I think you picked the nicest sections to do and I appreciated not having to walk the Meseta or even many of the very urban approaches to the bigger towns. I was able to really enter in to the mental, spiritual and emotional part of the Camino in a much deeper and richer way than I had expected, and that was mostly because I wasn't expending energy looking for accommodations or struggling by myself whenever there was a difficulty or an issue. I think what you are doing is fabulous! amaWalkers Camino (Pty) Limited -2010 Registered in terms of Section 14 of the Companies Act 2008. Registered Company number 2012/073214/07 Address: 37 Broadway Road, Westville 3629, South Africa.